Home Childhood Sexual Abuse	A therapy breakthrough that answers some questions and creates even more. A therapy breakthrough that answers some questions and creates even more. Friday was one of those days that didn’t start out too badly but quickly went to hell in a hand basket within a matter of minutes. Why do weird things always happen on Fridays? I really just don’t know. Maybe it’s a full moon or something or maybe it’s just my dumb luck. Let me give you a little background of what brought on the events of that lead me write this post. Last week in a session my therapist asked me if I could bring in some pictures of me as a child around the time that the sexual abuse happened to me. I said sure, I can probably dig some up. So I scrounged around my house and then I called my parents to see what they had packed away in the attic. My mom found a few more and I went to pick them up and she happened to ask me if it would be a alright if she wrote down some thoughts about what she remembered of me as a child, for my therapist. I immediately got a knot in my stomach and that sick feeling that this was not going to turn out well. However, in the interest of healing I reluctantly agreed and said to put down whatever you want in an email and I’ll go over it in my next session. My mom knows that I go to see a therapist but she doesn’t know what we talk about to any degree. So Friday around 11 AM I get the email and at first I wasn’t going to read it, I was going to save it for the session, but something made me read it. And from there emotions spiraled south. As it turns out she thinks that everything started to go wrong in my childhood, including the abuse, around the age of 5, whereas I remember being around 10 to 12. She also brought up certain things that happened to me that I don’t even remember ever happening. Literally no recollection whatsoever. Without going into much more detail, because we would be here forever, suffice it today and I spent the entire day questioning everything that I remembered so far about my life. 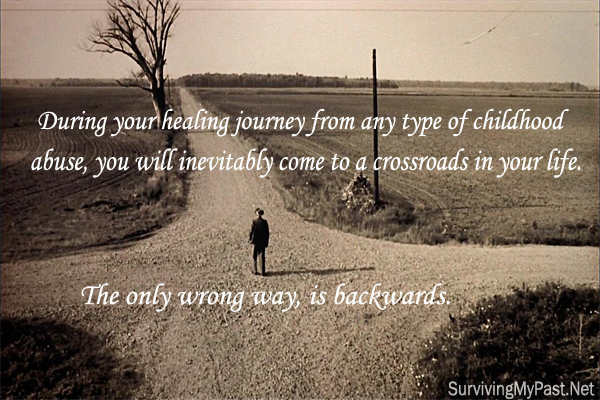 Everything I worked through in therapy and still do, is that all backwards and misinterpreted now? Is my entire life a lie? Emotional mind has completely taken over! She then tells me that she had tears in her eyes reading that letter. Because she can see that my parents care about me and have been worrying about me my whole life. I built up a wall my entire life to keep everybody at arm’s length. I’ve never been deeply vested in any relationship because I’m afraid of getting hurt or judged. I don’t let anybody in to the inner being that is me at heart, except my therapist. To be quite honest she knows more about me than anybody else in my entire life. And that includes both of my ex-wives and anyone in my family. When she started to talk about the letter, I immediately went on the offensive and brought up everything bad that my mom ever made me feel in my 44 years of existence on this earth. I brought up the judgments, the way she doesn’t agree with my lifestyle, the way that I was never good enough in the religious sense, how bad my music was, and how if I didn’t do things the way they were supposed to be done I was going to be miserable my entire life. Why my marriages didn’t work, and how I picked bad friends to hang out with. Basically taking whatever tiny bit of self esteem I may have had left and crushed it beyond all comprehension. My mom also can’t keep a secret to save her life. When I was in my mid-20s, I told her in a very vague way that I had been abused as a child. she went and told a whole bunch of people! Of course I never realized so many knew anything about my past until recently. That was my secret and she had no right to tell anyone! I feel like she betrayed my trust in ways that just completely shattered me from ever opening up again. My mom is so set in the fact that her way is the only way that you can’t tell her any differently. So my entire young existence all the way through middle school and high school and pretty much even still today it’s all about the way that I should be doing things versus the way that I actually am doing things. I should raise my kid this way or that way, I shouldn’t let them do this or that, I should listen to this or that music, I should spend more time with the family, I should open up more. The list just goes on and on but hopefully you get the picture. After telling my therapist all this a light bulb comes on and she says that’s it! To which I replied, what? She already known full well that I put up walls and don’t have a big support system, but we were trying to explore why in our talks. I should clarify, that she isn’t trying to pit me more against my mom, but rather she’s pointing out and reaffirming what I’m feeling, and that made me feel comfortable that she understands. Between those feelings of shame and blaming myself for my abuse, it’s no wonder I feel so screwed up. She went on to say, that she understands more now why therapy is so important to me. Not just because I’m interested and passionate about healing, which I obviously am. But because this is the first time in my life that I can open up and be myself and not be judged. I can finally share what’s been in my heart for so long. I spent my entire life putting up walls and making people think that I’m OK and everything is cool and I’m a happy guy who gets along with everybody. A dude who never has any problems and is always willing to help others. When inside I’m a total wreck, ashamed of my past, and worried about being judged for anything and everything. I’ve never had a really good relationship with my mom and now I’m starting to make sense as to why. To this day I get anxious around her, and I never feel comfortable. That’s a terrible way to live but it’s true. Even though she’ll tell me she’s proud of me, and I suppose that she is, I know deep down inside I’m waiting for the judgment to come out in some way, either verbally or just that I can tell what she’s thinking. When I brought in those pictures, my therapist was assuming that they would be a lot of sad faced, straight-faced, very awkward looking photos. As it turns out most of them are all smiles and I look like a perfectly normal kid. At least according to her. I think otherwise. Anyways, she went on to say that I’m the first person in all her years as a therapist and doing research, where childhood pictures didn’t match up to the pain, hurt, and struggles that are so prominent in my life. For my brain to be able to comprehend, put up walls, cause me to dissociate, and generally act the way that I did for so long and at such an early age, is I guess in some ways amazing. I successfully managed to make people think I was OK for decades. So now I have to process all this and try to figure out what to do with it. I still have more questions and there will be more things to talk about an upcoming sessions, but today was a breakthrough and in some ways it was both good and bad. I’m understanding myself more now than I have in my entire life and my therapist is such a big part of that healing that I can’t thank her enough for her wisdom her kindness and her understanding. That’s not to say that she lets me off easy in sessions. Far from it! Therapy is emotionally draining an intense but with her help I’m finding my way through life now and rediscovering who I am and what I’m about. I can’t change the past, so if I can figure out how to use radical acceptance in that respect, it will go a long way in my healing. That’s still a ways off however, but I guess it’s something to shoot for. I’ll end this post with stating that, I don’t hate my mom and I’ll likely not confront her about this. She’s 80 now and there’s probably no point. I am however struggling with this new information about how so much went down in my life and how some of it ties back to her. Sorry this post was so long, but after Friday I had to get it all out. I appreciate you reading it! It means a lot to me. Your mother and mine sound very similar. I too never had a support system and never trusted anyone. My shame has kept me alone and isolated. Thanks for sharing this.